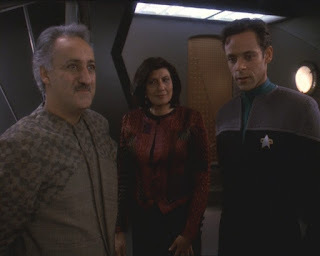 Doctor Lewis Zimmerman arrives on DS9 with the intent to use Julian Bashir as a template for a new long term holographic doctor (LMH) to replace the current EMH which as we know is modelled upon Zimmerman himself. Bashir seems a little uncomfortable but his friends are delighted for him so he goes with Zimmerman who tells him he'll need lots of background information from friends, family and colleagues as well as psych profiles to build the holograms AI. Julian asks him not to contact his parents who he claims he is estranged from and Zimmerman understands but immediately makes a note to contact them. Julian is then quite surprised when his parents turn up on the station, in fact they get delivered to Sisko's office during a meeting so there is nowhere to run for the good Doctor and we see that while his parents seem open and friendly their son is very uncomfortable. Zimmerman continues to work on the LMH while being smitten the Dabo girl Leeta who he gets to interview since she is a former "friend" of Julian and it may not be totally professional but he asks her out during the interview and she says yes. Rom who has designs on Leeta is shocked but still unable to truly express his desires for her and so the "b" plot of the story continues. The truth behind the estrangement of the Bashir's is revealed when we learn that as a boy Julian was having issues in terms of mental and physical development, his parents took him to Adigeon Prime where genetic manipulation was performed resulting in a highly advanced human which is illegal since the times of the Eugenics wars. The proverbial hits the fan when his parents confront Julian but it turns out they are talking to the hologram and being overheard by Miles and Zimmerman, Miles and Julian have a frank chat and Julian is convinced his time in Starfleet is over. Meanwhile Zimmerman is continuing his pursuit of Leeta by offering her the position of running the cafe on Jupiter Station while she is fresh out of the shower, flowers were involved which could not have been cheap so credit where it's due. Doctor Bashir, I Presume? is a great little episode, not a lot is going on to be honest but we get the beginning of the unexpected romance between Rom and Leeta and the background to Julian along with some good character building between him and Miles. It is a very low key episode with focus on some of the secondary characters which is one aspect where DS9 really stomps all over the other Trek franchises. The episode opened up with a longish shot of Leeta and her spectacular costuming which emphasises her cleavage, being a Dabo girl distracting and enticing players is part of her job but Leeta is a very open spirit and she never comes across as being exploited or too easily manipulated. I have to admit I was impressed how Chase Masterson with some simple body flexing and expression made it clear how "welcoming" should would have been to anything positive Rom had to say but he blew it. Quark was wicked in his comments on his brother and Leeta but that's Quark for ya. We also learned later how Rom has taken a five year marriage contract, got his son out of the deal and then failed to read the contract extension and lost all his money so perhaps his reticence can be excused. I did have issues with how easy Julian's parents got access to what should have been a restricted lab, the secret had to be revealed somehow so we can let that go I guess and in return we got the excellent chat between Miles and Julian, bros for life. Ultimately this episode is about taking control of your own life, Julian wants to resign before his future is taken out of his hands but is beaten to the punch by his father finally taking responsibility for his own actions. Rom finally gets a backbone at the last second before Leeta leaves DS9 and takes control over his immediate future and while you can say Leeta and maybe Zimmerman were allowing others to set their course they both had made decisions, maybe not great ones as it turned out but they had been made. This is one of my favourite episodes, some great acting from everyone involved especially the guest stars and a good mix of drama and humour. My only real issue is that for the crime committed two years in a penal colony was a little on the light side but I wonder if it was all being hushed up, the Federation wouldn't want anyone to know genetic engineering had achieved a very positive result.